There are almost 30 cows and calves living on the farm among the other animals. You can come and see the milking by yourselves. Some of the fresh milk is served to the cats. 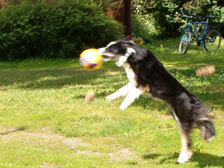 Kamu the dog can play some ball games with you, and beware, he probably won't get tired before you do. 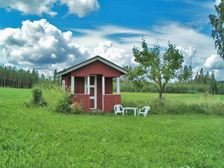 The wide yard of the farm ensures good possibilities for different ball games. You may also want to get familiar with different work done on the farm. In the nearby forest there is a nice footpath for hiking (1,5 km). If you get hungry, you can barbecue or fry some pancakes by the grill shed. At the winter there are ski-tracks around the farm. How about having your party on the farm at the countryside? Milking a cow, driving a pedal tractor and comfortable evening gathering in the grill shed. Finally to Jämsä center, only 5 km away. The whole crew can stay overnight with us. Ask for more and let's plan a special program for your parties!